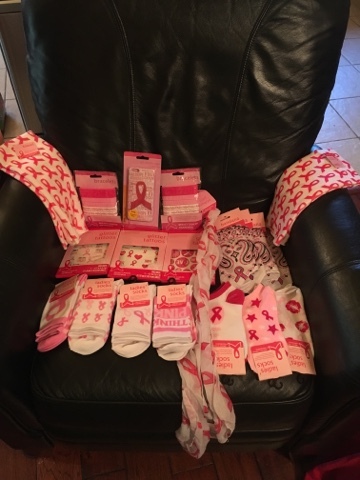 Self Made Beauty: Dollar Tree Breast Cancer Awareness Products. Dollar Tree Breast Cancer Awareness Products. I found these great deals at Dollar Tree today in the new Fort Worth Presidio shopping area near N. Tarrant Parkway and I-35W. I absolutely love the bandanas and the fact that I got so many socks for $1 each! They had all sorts of designs for mobile phones of every kind too. The selection was great. I passed on the cookie for cans. I have plenty of those and bottle cookies from all the Breast Cancer Awareness events in the past. The glitter tattoos will help the girls with Pink Out day in October at their elementary school too. Labels: Breast Cancer Awareness Products from Dollar Tree.